The highest form of scandalous patriotism is real estate, often blood soaked, and almost always fortified. What one controls is often less important as who is doing so. In the case of Kosovo, attempts at control, overt and covert, have been exerted for years. Officially, Serbia lacks de facto effectiveness, a state of affairs in place since the aftermath of the 1999 bombings by NATO. Neither does Albania, which also acts as a stalking counterpart in the region. Kosovo itself occupies a legal twilight zone, tormenting those in search of certainty, puzzling international legal scholars and experts in the field of recognition. The territory itself has been pockmarked over the years with ethnic displacement and redistributions. Concentrations of Serbs, for instance, can be found across the Ibar River, many having fled in the wake of avenging Albanians in 1999. Governance has been shot to pieces. Security incidents take place during the course of each week. Various groups, elements, and bands of not so merry creatures have done their best to insinuate themselves into the ethnic and loose framework of this fragile entity. Such conditions have been facilitated by the less than forceful assertion of control by NATO and the United Nations, notably over matters touching on security. In such a vacuum, vigilantism and crime thrive in abundance. 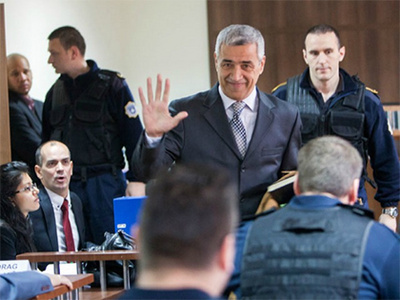 Oliver Ivanović, who was gunned down on January 16 outside his party office in Mitrovica, was one such figure to rise out of this anarchic storm. A Serb who nonetheless still engaged Albanian counterparts when needed, his political awareness was such as to be inaccurately labelled as a moderate. The informed pragmatist would have been more accurate. No figure of prominence can ever function in the politics of Kosovo without cracking the odd egg, if not skull. Reputations are often made in the cauldron of most resistance and greatest defiance. Ivanović became known for being the front man of the self-styled bridge watchers, keen to ensure that Albanian influence stopped before the town of Mitrovica. Ivanović, however, had noticed a change in local conditions, notably touching on Mitrovica itself. Albanians were, for one, no longer the largest threats, the irritations in the ointment. The agents of disorder and decay could be found within. In the aftermath of the death, political figures are treading on water. Serbia’s Aleksandar Vučić took stock and paid a visit to Mitrovica, a point hat immediately drew comments from such figures as Dejan Jovic, who called it his kosovski momenat, or “Kosovo moment”. This was hardly meant to flatter: the late Slobodan Milošević paid a trouble-stirred visit in 1987 promising that “no one should are beat you again”. The blood was rushing, hearts were aflutter, and the separatist feelings were biting. As Gordana Knezević noted, the greeting for the Serbian leader on this occasion was different. 1987 had been all bluster and nationalist stirring, spotting and detecting enemies. Now, the log of concerns was more immediate, tangible and desperate: a fear of local ruination, despoliation and lawlessness. His response to such insecurity was similarly more contained. Some fairly pointless speculations have been made in assessing this brutal incident. One view is that this was blood shed with potential, a murder with decent consequences. People, for one, will start talking: in Pristina, in Belgrade, in Kosovo. This aspirational view is well and good, but will hardly be of comfort to those who hanker for that most novel of ideas in Kosovo: stability. Dr. Binoy Kampmar was a Commonwealth Scholar at Selwyn College, Cambridge. He lectures at RMIT University, Melbourne.